Omega Oils are not all the same. Is salad healthy? Not always. While a good portion of lettuce and vegetables can be just what the doctor ordered, an unhealthy salad dressing can undo all the good you’re doing for your body. 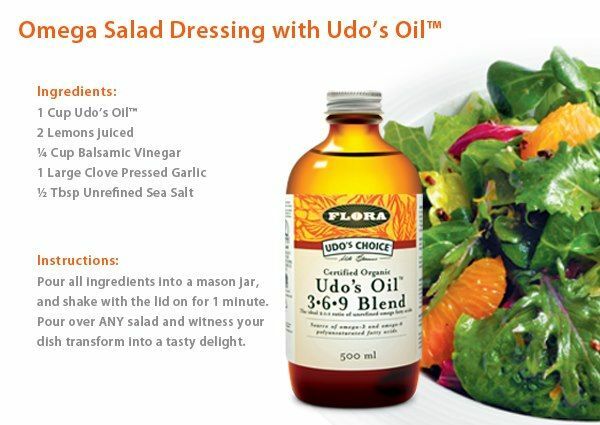 Take your salads to another level with omega-rich Udo’s Oil and your body will thank you! Omega oils are full of the good stuff: healthy fats. Upgrade your salad ideas and enjoy last few summer days with healthy, delicious and refreshing meals! Healthy fats can be easily subbed for any oil called for in your salad dressing recipe. While fats often get a bad reputation, the reality is some fats actually make your body flourish and boost your brain power. If you’re looking for a healthy oil to add to your diet, you can’t go wrong with Udo’s Oil Omega 3+6+9 Blend. This foundational oil provides the omega-3 and -6 essential fatty acids (EFAs) the body needs but cannot make on its own. 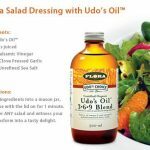 Udo’s Oil is designed to deliver the good fats your body needs to properly function, improve cognitive abilities, and support your overall health, so subbing it for regular olive oil makes all the good you’re doing with a salad even better. Omega oils are clinically proven to reduce your risk of cardiovascular disease, improve your heart’s overall health and function, build muscle, and improve your cognitive abilities and brain health. Enrich your salads with these healthy omega oils EFAs is one of the easiest ways you can treat your body to the good stuff. When it comes to food I’ll always go for quality over quantity. Udo’s Oil Blend Omega 3+6+9 is organic, raw and vegan. Perfect combination for your salad, smoothie or any meal you like!